As most of you know, I have an absolute mania for harmony and vocal groups – I’m mad for the melodies, I’m cuckoo for the chords! I have been a rabid fan of these groups since I was a mere sprout, (which was so long ago I’m practically a beanstalk now!) and although I have jumped feet first into this kind of music many times, I decided to devote an entire record to some of the girl group music that I have loved since I was a kid. My old friend Marc Shaiman and I went into the studio in 2014. We started out by choosing nearly 50 of our favorite songs and then went through the agonizing process of editing the list down to only 17; I swear, making some of those decisions, I felt like Meryl in Sophie’s Choice! We then invited some of our favorite people in to play. A great album is like a fine wine, it’s not half as good unless you’re sharing it with good friends. While I did a lot of the background chores myself, we also had some great backing singers in as well. It’s always been a particular thrill for me to watch and listen to background singers work their magic; the great ones are great artists. 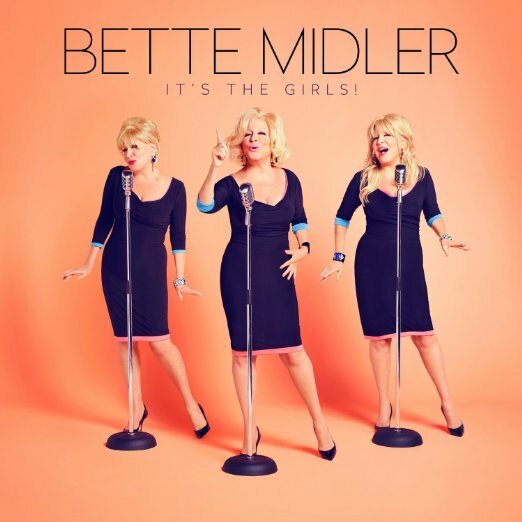 The experience was a thrill and the result is overwhelmingly happy, except for a couple of ballad surprises, because what’s a Bette Midler record without little kleenex, right? Hey! It worked for Piaf! We’ve stuffed so many glorious girl groups into this album – it’s an exquisite explosion of estrogen! You’ll croon, you’ll cry, and you’ll walk away craving more. Yes, I love the music these women made, but I also love the world of the groups themselves. The legends, the rumors, the hair!! How many movies and books have come out of that world? Not enough, if you ask me!! Some of the groups were formed and trained at home, like the Boswells and the Andrews Sisters, some were put together by the labels themselves, and some met on street corners or subway staircases, looking for an echo. But whether they were sister acts or musical arranged marriages, they all had one thing in common – that SOUND! Well, the fantastic outfits didn’t hurt either. Or the synchronized dances. Okay, so maybe three things in common. Some girl groups survived, some didn’t; some were taken advantage of, some wrote their own rules, many went through fire just for the chance to sing. There is no denying that much of what they went through, just as women, was difficult, but there is also no denying that what they gave to the world is still relevant, and still necessary; joy, attitude, and the golden dream of a youth that will never fade. They say behind every great man, there’s a great woman. Well I think that behind every great woman, there should be at least two other women singing and dancing in perfect unison. I hope “It’s The Girls” gives you the impulse to dig deeper into the music and the lives of the women who made it. You won’t regret a moment….